The first floor is nice enough and decorated just as you would imagine; seashells, anchors, and sand on the floor; complete with pillows on the couches and pictures on the walls that say things like “salt life” and “Gone Fishin’”. It’s pleasant, but you’ve seen it before. Bored by your surrounds and not wanting to be rude you ask to see the rest of the house, so your host brings you upstairs. The second floor is still adorned with the same beach décor, but the natural beauty of the structure is what’s striking; reminding you that everything in life deserves a closer look. There are high ceilings, and windows that reach from the floor to the sky. You can see in the not too far distance a bluff and beyond that the calm ocean water. The golden sun is flooding the entire open layout upstairs. The light is shining on everything. Nothing is hidden and everything is beautiful…in spite of the décor. For hours you pour wine and laugh with your host. The atmosphere lends itself to happy times. You share good memories and your hopes and dreams. Here and there a whisper of fear or an anxiety enters the room, but the sun soon catches them and the unpleasantries cast their shadow no more. Throughout the long afternoon the sun begins to set and the glow of the moon is now dimly lighting the room. You notice you’re running out of things to talk about and start to feel anxious. During a lull in the conversations you walk over to one of the giant windows to look at the moonlight on the water and escape the uncomfortable silence. 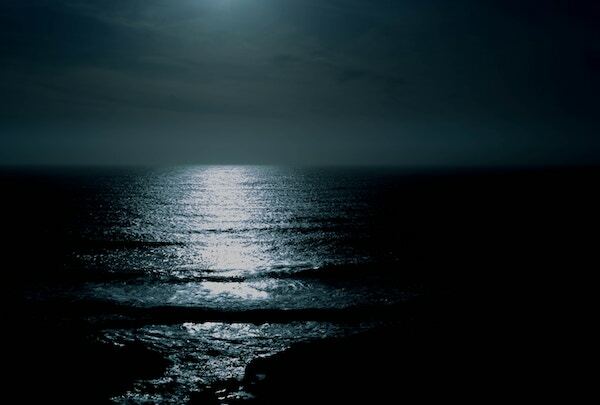 Gorgeous and unsettling is the dance of the moonlight on the black sea; forever trying to break through a darkness that not even the sun is able to fully illuminate. As you begin to unravel so does the night and you both decide it’s time to go to bed. It’s too hot warm of an evening to sleep upstairs, even with the ocean breeze, so you decide to sleep in the basement. Feeling content with a day full of banter and catching up you say goodnight to your host. You head downstairs past the boring beach and over to the basement door. Behind the door you find more darkness, but what you can’t find is the light switch, so you make the descent alone down into the darkness. The cool air in the basement is inviting despite the fact that you feel vulnerable being deprived of your sense of sight. After banging your knee and stubbing your toe on what you would imagine is some sort of end table, you find yourself comfortably resting on a sectional. Your “bed” for the evening is comfortable, but by no means is it any acceptable stand-in for a real bed, but you really don’t care because it’s quiet, dark, and cool. Despite all of this, you still can’t fall asleep. When you close your eyes your mind opens and, in there, all you see is the dance of the moon and the sea. It’s troubling you enough that you decide to figure out exactly what it is that’s keeping you up tonight. You notice you’re drifting into “what if” territory, which you know is just a short distance away from the corner of fear and regret, so you turn yourself around and try to think about something else. The only other thing in your mind, however, is the scene of the moonlight on the water. So on you go unraveling, thinking about all your shortcomings and all the things you didn’t do in the past but wished you had. What is it about the moon that gives us permission to roam the halls of ones own consciousness? Why does that dreamy dim light fill those halls in such a way to that you can see apparitions; they seem foreign and also somehow familial? This must be what people refer to as their “demons”, you think. To you, in this light, they don’t seem diabolical at all. It’s melancholy seeing these ghosts who want nothing more than to tell their story. So one by one you listen to them, slowly coming to the realization they are all just parts ignored. Their stories have a common theme: love. All of them were ashamed to admit while they were alive they wanted to connect; ashamed to want love. In the end they died alone, having not followed their hearts, and this is where you buried them. “How do I walk around with this place inside me, this place with ghosts and moonlight and all these hidden things?” “How did I even get here? “, you question. You’re suddenly startled back into the basement as you hear the shuffling of something to your left. You call out into the darkness to find that your host had found it too hot to continue resting upstairs and decided to join you in the cool dark basement while you were visiting that eerie place. You lie there in the darkness wondering if your companion also took the journey, but before you decide to ask you get your answer. “What is it you want most in this life?” your friend asks, sounding almost as afraid of the questions as they are of your answer. In that moment you know they too have been to this place. “Love”, you whisper with certainty. And the rest of the night is silent.